Hi again! Happy Wednesday! Today I am excited to feature my first ever set created through Polyvore. I was contacted by ModCloth and asked to join their Uniquely You campaign to create a look around a specific piece that they feature each week. I was beyond excited when I received the email and can't wait to share even more outfit creations for their campaign. This weeks featured piece is the Rainy Day Rendezvous Dress and below is how I would style it. I think the colors are great for Spring and I'd pair it with a chambray shirt or blue jean jacket to make it a bit more casual. And hello mustard scarf... I couldn't help myself. They have a ton of other cute dresses for Spring. Be sure to check those out HERE. So what do you guys think?! If you had this dress would you dress it up or down? There are so many different ways that it can be styled. I'd love to hear how you would wear it. As always, thanks so much for stopping by! 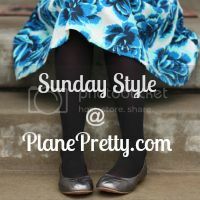 And click the button below to see what other great bloggers are wearing this week.